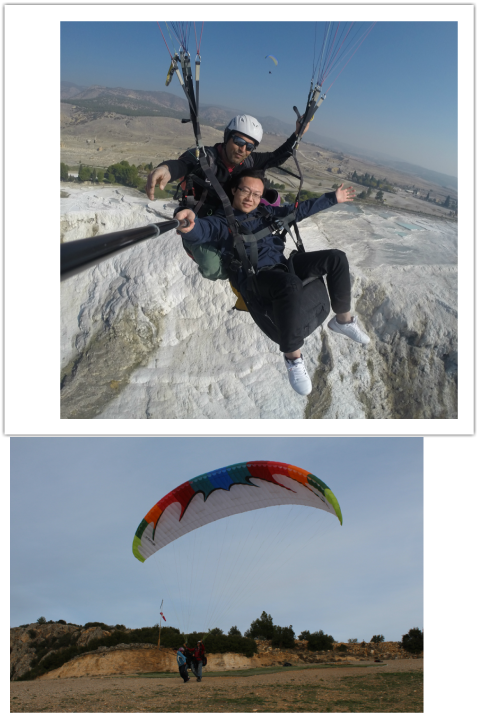 Cost of Tandem paragliding: Pamukkale 95$ per person. Please ask for the prices at the other locations. transportation from and to hotel in the area of Pamukkale. We fly all year round 3 -6 times a day. The whole journey of each flight from pick up point to drop off one takes one hour. The period of the flying time ranges between 10 mins - 35 mins depending on wind conditions. This duration of the whole journey offers you the chance to make other plans and enjoy your stay wherever you are or may be want to fly again . The first flight which is known as the morning flight/ sunrise fly is at 06:00 a.m it is known for the clarity of the air which the best chance for stunning photography. The last flight is at 7:00 p.m. We call it the “Sunset Flight”.During the sunset flight you can have nice pictures and videos because of the natural effect of the sunset colours and its reflection . Yet all other flying times are good. We provide boots & helmet. If you have your own boots,you can bring them with you. Our experienced pilots (instructors) give you all necessary information about what to do and not to do so you will feel comfortable and safe. We usually try to fly side by side or close to each other (depending on weather conditions) so you can take pictures of your family and friends in the air ..
All our pilots use their latest Go-pro cameras to make your flying experıence with us a special and unforgettable one. All the pictures and vıdeoes recorded during the flıght will be given to you on an SD CARD 4 GB OR DVD -CD with an extra charge...of course this is done after the flıght is finished..and who would not take this unforgettable experience with him\her !!! !